The Bradwell Bay Wilderness Area is a good example. Deciduous hardwood swamps are found along rivers and in basins where the forest floor is saturated or submerged during part of the year. Ohter terms for this community are floodplain forest, hydric hammock and river swamp. Plants: This community is characterized by large hardwoods such as blackgum, Other typical overstory trees are bald cypress and cabbage palm or swamp cabbage as the seminoles call it. Understory trees include buttonbush, dahoon, wax-myrtle, American hornbeam and elderberry. Most plants in mixed hardwood swamps are deciduous. Swamp forest productivity and species mixtures are determined to a large degree by the kind and condition of alluvial soil deposits. Animals: River swamps provide habitat for a large variety of animals, some of them rare species. If the ivory-billed woodpecker still exists in this state, as some ornithologists suspect, it probably inhabits large swamp forests. Other swamp animals are the bobcat, deer, turkey, gray squirrel, otter, pileated woodpecker, wood duck, and numerous songbirds, turtles and snakes. You can see a cypress swamp at The Bradwell Bay Wilderness Area in the Apalachicola National Forest. Cypress swamps are usually located along rivers or lakes or scattered through other communities such as flatwoods or dry prairies. They also occur along shallow drainage systems known as sloughs or strands, Cypress swamps have water at or above ground level for much of the year. 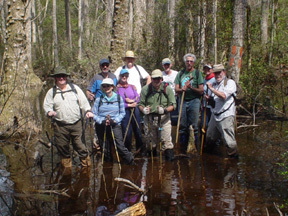 Swampwise hikers will enjoy these areas. Plants: The bald cypress is the dominant tree along lakes and streams. The pond cypress occurs in cypress heads and domes, which are typically interspersed through flatwoods and prairies. Trees often found with cypress include balckgum, red maple, willow, pop ash, pond pine, and slash pine. The overall tree diversity of cypress heads is relatively low, that of strands and stream margin forests is somewhat higher. Smaller plants include wax-myrtle, buttonbush, various ferns, poison ivy, green brier and numerous air plants. Arrowhead, Pickerelweed, sawgrass, and other marsh plants are often found in areas of open water within cypress swamps. Animals: The deeper cypress swamps have rather limited populations of wildlife but aquatic animals such as salamanders, water snakes, alligators and otters may be abundant. More shallow ,seasonally flooded areas such as cypress heads are important refuge areas for deer and other large animals. The Apalachicola National Forest gives many opportunities to see one of this areas most common and biological areas. 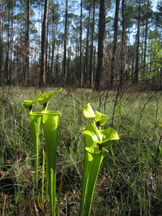 Flatwoods are the most abundant community in Florida. Before 1900 they covered half the state. Most flatwoods occur on the level areas, or terraces, between ancient shorelines. Layers of marine sand accumulated on these terraces in prehistoric times, when they were covered by shallow seas.Â Longleaf pines grow better on drained sites. Slash pines flatwoods are usually found in areas of intermediate wetness. Pond pine predominate in the wettest areas. Plants: Flatwood have few tree species. Shrubs and small trees vary among the flatwoods types, but many plants are common to all three communities. Common understory plants include wiregrass, saw palmetto, wax-myrtle, gallberry and fetterbush, Flatwoods are usually sprinkled with cypress domes, bayheads or small titi swamps. Animals: Flatwoods have a fairly large and diverse animal population. The large animals, such as deer, bears, bobcats, raccoons, and gray foxes, are most commonly found around the boundaries between the flatwoods and hammocks, cypress heads, bayheads, titi swamps and open areas. Other typical animals of the flatwoods include black racers (snakes), fox squirrels, cotton rats, and cottontails. Bird include the brown-headed nuthatch, Bachmanâ€™s warblers and rufous-sided towhees. You may find examples of hammocks in St. Marks National Wildlife Refuge. Hammock is a Florida term for a cluster of broad-leave trees. Trees in hammocks are often evergreen and usually grow in relatively rich soil. The hammock community is similar in many respects to the mixed hardwood and pine of the panhandle. It is the climax vegetation of most areas of central and peninsular Florida; The mixed hardwood and pine community is the climax community of the panhandle area. Central Florida hammocks occur on fairly rich sandy soils rather than the clay of the panhandle community and are prevalent in areas where limestone is near the surface. Hammocks can be further classified on the basis of vegetation into upland hammocks, coastal hammocks, and live oak-cabbage palm hammocks, which are scattered within other communities, Hammocks are similar to the mixed hardwood and pine woods of the panhandle but lack the shortleaf pine. American beech and other more northern vegetation. 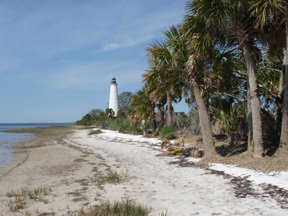 If you hike here you will also see one of northwest Floridaâ€™s most recognizable seaside landmarks at St. Marks lighthouse. Plants: Characteristic trees of central Florida hammocks are southern magnolia, laurel oak and American holly. Animals: Characteristic animals include the spadefoot toad, tufted titmouse, great crested flycatcher, golden mouse, wood rat and flying squirrel. Fort Braden Trail has excellent examples of this. The mixed hardwood and pine community is the southern-most extension of the southern Piedmont mixed hardwood forest. It occurs on the clay soils of the northern Panhandle. Plants: Younger growth may be primary pine with shortleaf and loblolly pines predominant, but as succession continues various hardwoods dominate. Hardwood trees of this area include American beech, Southern magnolia, Florida maple and numerous others. The understory includes dogwood, red mulberry, hop-hornbeam, American hornbeam and redbud. Animals: The types of animal vary with the maturity of the forest, Rapidly reproducing, broadly adapted species such as cottontails and bobwhites are typical early succession animals; more narrowly adapted species such as moles, woodpeckers and woodcocks are typical of more mature forests. Other characteristic animals include the barred owl, pileated woodpecker, red-bellied woodpecker, white-tailed deer, gray squirrel, shrews, gray fox and cotton mouse. St. Marks Natioanal Wildlife Refudge is a good local example. Salt marshes occur on low wave -energy shorelines north of the range of the mangroves and among the mangroves in may areas of south Florida. Salt marshes also extend up into tidal rivers. Plants: Many salt marshes are dominated by one plant, usually cordgrass of black rush, The species existing in any one area depend on the degree on inundation by tides and the salinity of the water.Salt marshes often blend gradually with freshwater marshes, forming a transition zone of salt water and freshwater plants. Animals: Salt marshes harbor large numbers of invertebrates which are fed upon by many of the higher animals of the marsh and estuary. Birds are particularly numerous in and around salt marshes. Rails, egrets, gulls, terns and seaside sparrows depend on the marsh for food, The diamondback terrapin, salt marsh snake, mink, otter raccoon are other characteristic animals.